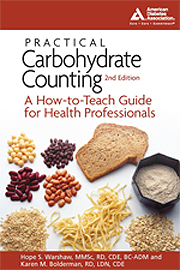 Practical Carbohydrate Counting: A How-to-Teach Guide for Health, written with co-author and diabetes nutrition expert Karen Bolderman, RD, LDN, CDE; this book is designed for health care providers who teach people with diabetes about carbohydrate counting. It provides a comprehensive understanding of the ins and outs of basic and advanced carbohydrate counting – today’s most popular diabetes meal planning approach. This resource also provides concise and practical information for teaching including: skills and readiness checklists for both basic and advanced carbohydrate counting, methods for calculating and fine-tuning carb-to-insulin ratios and correction factors for advanced carbohydrate counting. The book is filled with tips, tools and resources for teaching including recording forms and resources to access the carbohydrate counts of foods. Case studies bring the process of teaching carbohydrate counting to life. Need Continuing Professional Education credits? Earn 16 credits by purchasing the self-study guide C194 Practical Carbohydrate Counting: A How to-Teach Guide for Health Professionals developed by the Warshaw and Bolderman for Wolf Rinke Associates, Inc.
For most people, eating is a mindless action. For those trying to improve their health, it's another story. "Practical Carbohydrate Counting: A How-To-Teach Guide for Health Professionals" is a solid reference from the American Diabetes Association for nutritionists who are trying to teach their patients the skills they need to deal with carbohydrate management in their everyday life. With plenty of advice on carbohydrate's relationship with insulin and blood sugar, "Practical Carbohydrate Counting" is a must for any nutritionist dealing with diabetics. Why, What, Who and How Much?